Last night for dinner I decided to make some crostini to go with our meal. Since I had some grape tomatoes, and leftover packages of fresh mozzarella and basil, I decided to jazz up my crostini a bit, and make Caprese Crostini with a Balsamic Drizzle. Simple, delicious and elegant! If you’re not familiar with the term “Caprese” [kuh-prey-zey] Italian: of or in the style of Capri – It’s a dish prepared oftentimes as a salad with fresh mozzarella, tomatoes, and basil leaves, drizzled with olive oil. My version however is on crostini, making this perfect to serve for company as an elegant appetizer, or with a meal. Drizzled with a Balsamic Reduction adds a slight sweetness to the appetizer taking it right over the top. I hope you’ll try this recipe……..
Caprese Crostini: Lay sliced baguette on a foil lined sheet pan and brush one side with olive oil, and sprinkle with salt. Place in a preheated 425F degree oven for about 15 minutes or until edges are golden brown. Remove from oven. Add slices of fresh mozzarella on each slice of bread, top with tomato halves and sprinkle with basil chiffonade. Place back into oven for approximately 5 minutes or until the cheese has melted. Remove from oven. Drizzle with Balsamic Reduction and serve. Balsamic Reduction: Add 1 cup Balsamic Vinegar to a saucepan and bring so a boil. Reduce heat, and simmer for approximately 30 minutes or until vinegar has reduced to 1/2 cup. Vinegar will be thick like syrup. Allow to cool completely then add to squeeze bottle, cover tip, and store indefinitely. I like Caprese anything. 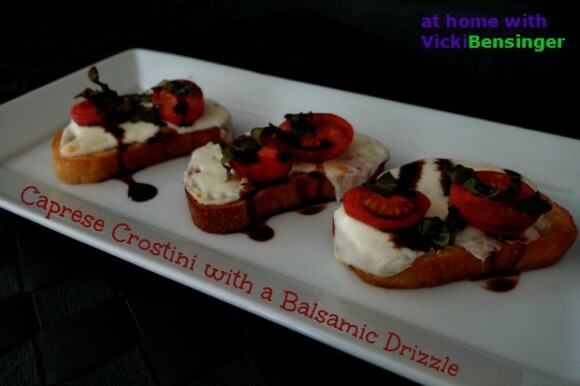 I’ve had Caprese-style crostini but it’s not something I make myself. I should! This looks great. Thanks. You should John it’s so easy. Thank you. It is delish and so easy. 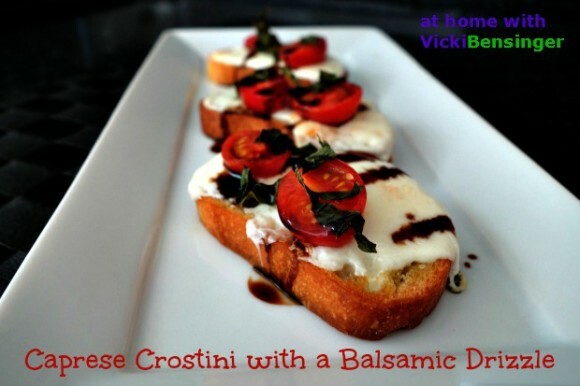 The balsamic gives it that extra kick that sets it apart from other recipes similar to this. I hope you’ll try it. I am a huge fan of Caprese. These crostini look so beautiful and scrummy! Thanks Angie. I hope you’ll try it. I could make a meal out of these gorgeous crostini. I LOVE this! You and me both. Oftentimes I have other dishes waiting for me but I end up filling up on the crostini because it’s always so good and satisfying. I hope you’ll try this. I’m with Maureen! This could easily be my dinner…and I’d be thrilled with every bite! I’m with you and Maureen too! Your crostini look terrific and have me dreaming of summer tomatoes from my garden. Oh lucky girl. I don’t have a garden but maybe someday I’ll have the time to devote to one. Yum Yum Yum!!! I wish I could have it right away! You can have it right away. Just run to the store, it takes no time at all to put together. I’ve never made a balsamic reduction but every time I see one, I want to make it. 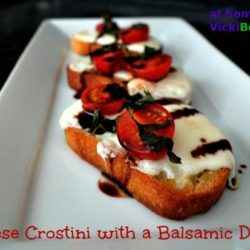 I love that you topped these Caprese Crostini with it. This is a great lunch or party appetizer. Thanks for sharing Vicki! This looks absolutely delightful. I love a good balsamic reduction over just about anything. Great recipe Vicki.